Beyond Genealogy: Always On the Job! People kid me about my Genealogy Today jacket, but I think it’s important as a small business owner to follow the creedance that you’re always on the job. The jacket accomplishes two things. First, it’s an amazing advertising tool. I’m 6′3″, so I make a good billboard. Second, it’s a reminder for me to be “on”. One of my mentors in the business world once told me that when you’re behind the closed doors of your office, you can relax and let your emotions show. But when you’re on the floor, “it’s showtime” and you should be upbeat and positive about the job we’re doing. So, in a way, the jacket is my uniform, and when I’m wearing it I’m ready for anything. It is a bit strange, however, to be standing on line (this happened to me in the post office) and all of the sudden the person behind you begins talking to the jacket (or the back of my head). But its a great way to strike up a conversation. One fellow genealogy webmaster whom I have a great deal of respect for is Bill Cribbs (check out his site Genealogy Buff). 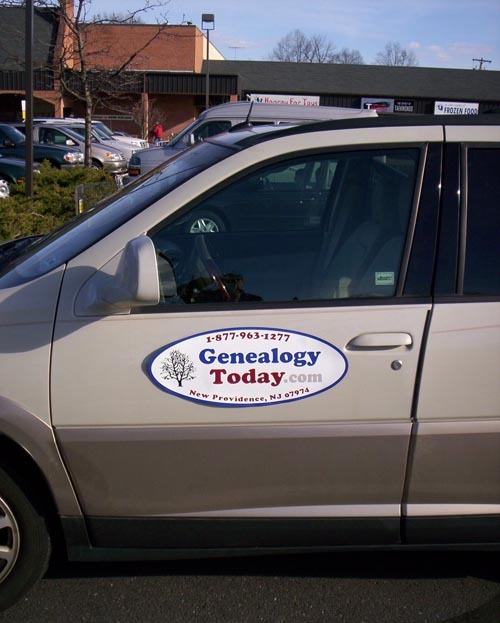 He’s really perfected the “always on” approach to promoting his web sites, but he takes the concept even further by not only mentioning his site, but first engaging the strangers he meets to get enthused about doing genealogy. He really promotes genealogy first, and his site second. I think in part, that’s what I am hoping to accomplish. Certainly I want people to visit my site, but I’d like them to get excited about digging into their ancestry. But all too often I switch into “marketing man” and chat up my site. You may also be walking through a parking lot in the tri-state (NJ/NY/CT) area and stumble upon my SUV (well, it’s really for Moon, our show dog). As you can see in the picture, the SUV is often “on the job” as I am about town running errands. Again, it’s serving a useful purpose as an advertising tool, however, it’s a bit embarrassing to come out of the grocery store and see two older women standing by your car chatting about the magnet they just saw. But, put on my happy face, give them a Genealogy Today card (so they don’t forget the URL), and Moon and I resume our travels. My point of this blog is that even the little things can make a difference. Even if you’re running a web site that gets thousands of visitors a day, they may only see your site and never get that feeling of it being “real”. When people SEE me with the jacket, or my truck, they feel a personal connection with the web site. They know there is a real person behind the scenes, and he’s just an average guy who even does the family grocery shopping. And it’s that confidence that leads to more word of mouth communication. Paul Allen (often referred to as the “other” Paul Allen) recently blogged, Are You Talking to Your Customers?, where he explains the benefits of speaking to the people who use your products and services. Paul, by the way, was one of the co-founders of Ancestry.com (and the subsequent company MyFamily.com). It is just as important as talking to the people that know your site, as it is to talk to people who don’t. One of the questions I always ask people is “what do you think a web site called Genealogy Today would offer?”. I chose the name back in 1999 because I wanted to develop a site that focused on new and unique ways to research (and resources to search).